Comments will be included in the Monday post. The Trade Blotter is updated. This entry was posted on Saturday, June 22nd, 2013 at 6:39 am	and is filed under Uncategorized. You can follow any responses to this entry through the RSS 2.0 feed. You can leave a response, or trackback from your own site. Barron's – LINE/LNCO Leon C. piece with A Bary rebuttal. I will always take the Leon side of anything. Let the 'WHINING ' begin! Interesting note at the end saying according to 'Formula' per gallon prices for Regular should go to $3.40 gallon. The local shortatge in the Upper Midwest (due to refinery issues now overcome)drove gasoline prices up 50 cents/gallon plus were immediatly noticable in approx. 10 to 15% reduction indisretionary spending for travel and restaurants in the local economies. Weak/inconclusive bounce from last weeks sell off. Last weeks oversold quantitative setup has a 84% history of bouncing back to the 10 day MA but so far intra-day demand volume has only brought price back to the Thursday's close creating a tentative balance at the 1583 volume pivot CHVN. Watch how 1583 is treated on Monday. Resistance at 1591. Minor support at 1564. Expecting a bounce, but there is no evidence yet that one is forthcoming from present levels. Watch demand intra-day volume and breadth expansion with a break of 1591 as key for short term upside attempt. 1606 is first upside supply followed by heavy supply from 1620 and above. Respect alternate scenario of further drift lower to major CHVN at 1543 if demand volume and breadth continue negative. Friday was a quadruple witching day, so some of you technicals could have been skewed one way or another. I think Monday will be more of a normalized trading day and should be more indicative of which way the market is headed. I was wondering if you can come up with a chart showing energy accumulation over last 3-6 months. Not sure how to do this but i'm sensing there's a clear rotation into energy names and the move down in equities is having less impact on energy shares. Also wanted to mention oil was back to 93, an area you mentioned before to be the in balance number. Almost a magnet, but non the less a higher number than we saw late last year. #8 Re Energy Accumulation/Relative Strength. 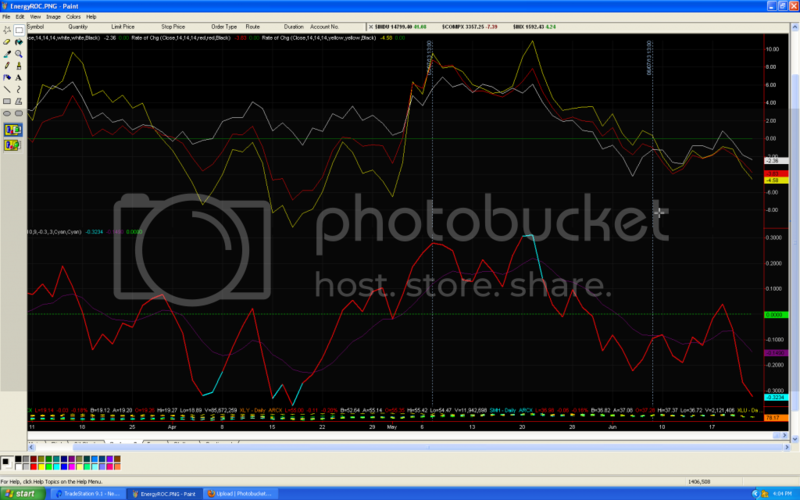 The chart shows XLE(red) and XOP(yellow) and the S&P500(white) rate of change in %s. During the early bit of the mkt rollover energy did show a bit of outperformance following May's relative strength. Since June 7th energy has fallen faster than the market as a whole. The bottom panel shows demand volume for XLE, which is negative on an absolute basis short term.For the past two trading days, energy is near the bottom of the sector pile on price change. #8 re Energy accumulation/Relative Strength.. Middle histogram (green) shows accumulation as measure by Chaikins money flow reached it's peak on 5/21. S&P peaked on 5/17 after the long run. $USD Back to mid range, quarterly balance(magenta) and long term CHVN at 82.88. Important volume pivot going forward after the rejection of major long term acceptance at 80.61 as too low. Which area will be the magnet? awesome stuff. will peruse though 12 later tonight. re 1 – thanks, thought he was going to divinity school, guess new dual focus here.